As Craig Smith sat down to address the media Sunday after the Utah State Aggies learned which team they would face in the NCAA Tournament, his voice was hoarse, as if he’d been screaming at the top of lungs for hours. The team, gathered together in Logan at Maverik Stadium, screamed in elation the moment it was announced that the Aggies are the No. 8 seed in the Midwest Region, and will play No. 9 Washington in Columbus, Ohio, on Friday. It’s Utah State’s first trip to the tournament since 2011. After clinching an automatic bid to the NCAA Tournament with Saturday’s win against San Diego State, the Aggies earned the highest tournament seed in school history. Smith said the team talked all season about winning the Mountain West championship. But now that Utah State is going dancing, as they say, he can hardly believe it. “This has been like a fairy tale,” Smith said. Utah State’s tournament bid is the culmination of arguably the best season in Aggies history. Smith joined the team as coach in November with plans to revitalize the program, and did that and more by leading his team to a 28-6 record and a Mountain West championship. 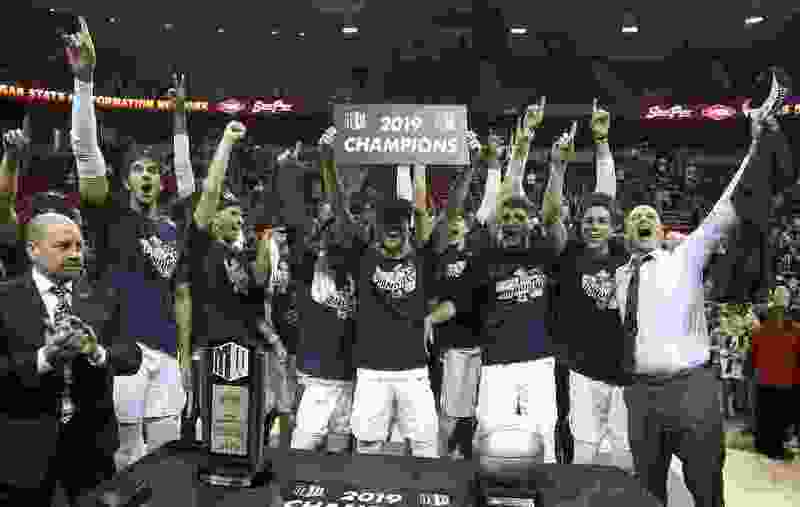 The Aggies were also rewarded with four MWC individual awards, further cementing the idea that Utah State is a force to be reckoned with despite not being in one of the sexier college basketball conferences. The matchup is an intriguing one. The Huskies won the Pac-12 regular-season title, but were drubbed by Oregon in the Pac-12 tournament title game on Saturday. They’re led by sophomore Jaylen Nowell, who averaged 16.2 points and 3.1 assists in 34 games. On paper, Utah State looks to be the stronger of the two teams. It averaged 79.2 points per game, while Washington scored 69.8. Sam Merrill, the Mountain West Conference Player of the Year, leads the Aggies in scoring (21.2) and assists (4.2), while MWC Freshman of the Year Neemias Queta leads in rebounds (8.9) and blocks (2.4). Merrill said he was shaking and felt “real butterflies” as the school’s name was announced on TV. Based on his first two years with the program, he said, he never thought the Aggies would be in the position to compete for an NCAA title. Basketball analyst Clark Kellogg said on the CBS broadcast that Utah State should advance past Washington. The Aggies take a 10-game winning streak into Friday’s matchup against the Huskies, who earned their first tournament bid in eight years. Sophomore Abel Porter likes the way the Aggies have been playing lately. While Porter said he knew almost nothing about the Huskies other than their positioning in the Pac-12, he believes the opponent does not matter at this point of the tournament.